Summary Report, Off-Highway Vehicle Infrastructure Fund Fiscal 2015/2016 it can be found here. An update on the trail closure in Tatamagouche . Trans Canada Trail in Tatamagouche is now reopened ! French River Bridge and Patterson Wharf Bridge have been redecked . Thanks to the Trails Assn. for making our riding experience even better ! Trail closure for 1-2 weeks starting Mon. Apr 10 , for redecking of French River Bridge and Patterson Wharf Bridge on Trans Canada Trail in Tatamagouche . Please ,plan accordingly . 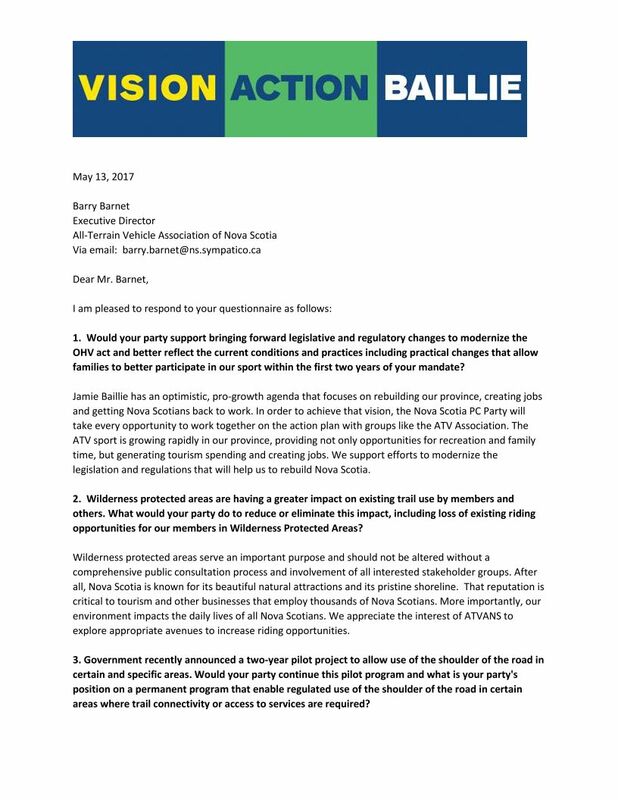 Update from Bob Gould , Tatamagouche Trails Assn .
" Ursula, the contract called for the trail to be closed for no more than a week at a time, and the contractor felt he could likely finish the big bridge in a week. I'm assuming he meant without paying weekend overtime. If problems are encountered, he is directed to make the bridge passable on weekends, if possible. 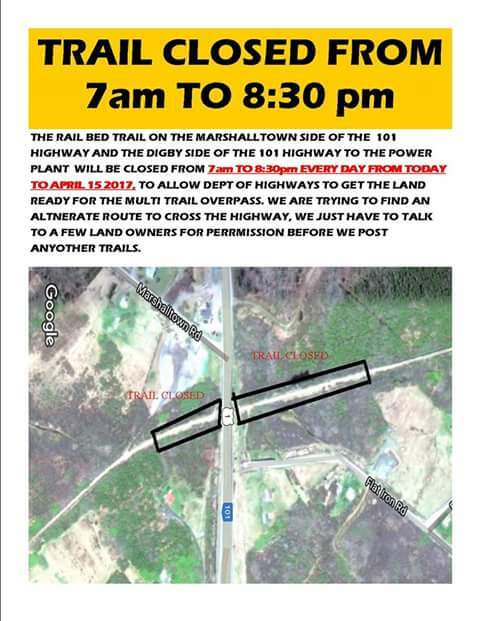 The rail bed trail on the Marshalltown side of the 101 HWY and the Digby side of the 101 HWY to the Power Plant will be closed from 7am to 8:30pm everyday starting April 5th through to April 15th, to allow the Department of Highways to get the land ready for the multi trail overpass. We are trying to find an alternate route to cross the highway. We need to talk to a few land owners for permission before we post any other trails. Thanks for your cooperation. motorized recreational vehicle trails in each province across Canada. other businesses as a result of increases in trail activities. vehicle (OHV) trail that’s both fun and sustainable during Canada’s 150 year celebration. For more information check out: www.cohv.ca. ATV riders and enthusiasts will descend upon the Lake Charlotte area for the 23rd annual Lake Charlotte ATV Rally on Saturday, February 4. With hundreds of riders expected to participate, Halifax District RCMP are asking everyone to keep safety a priority when attending the event. "If you're an ATV rider or just a spectator, we ask that you have fun in a responsible manner," says Cpl. Aaron Glode, Musquodoboit Harbour RCMP. "This event should be a good time for everyone. We will be there to ensure that this occurs in a safe manner." · Whether you're riding or driving, be aware of the traffic around you. Ensure other motorists and riders see you. · Obey the rules of the road and trail. Respect posted signs and other drivers and riders. · Stay on marked trails and do not drive across ice given how warm our winter has been to date. · Ride sober and remind others to do so as well. · Ride at a reasonable speed. Know your riding partner's driving limitations, as well as your own, and operate only at a speed that allows you to remain in total control of your vehicle. · Avoid rider distractions. Know where you are going before you arrive or pull off the road to a safe spot to consult a map or GPS. · Always wear protective clothing, including a helmet, gloves and eye protection. Wear layers of clothing to keep warm and dry. · Exercise patience when driving in and around congested areas. During the rally, the warm up shack and stopping points will be quite busy. · Give yourself lots of extra time to get to where you are going. · When parking ATVs and vehicles, keep valuables out of sight. · Ensure that your ATV is registered and insured. The RCMP wishes everyone a safe and enjoyable weekend. An independent economic impact study completed by Smith Gunther Associates Ltd., reported that in 2015, Canadians spent $6.9 billion on activities directly involving All-Terrain Vehicles (ATVs) and Recreational Off- Highway Vehicles (ROVs) also known as side-by-sides. 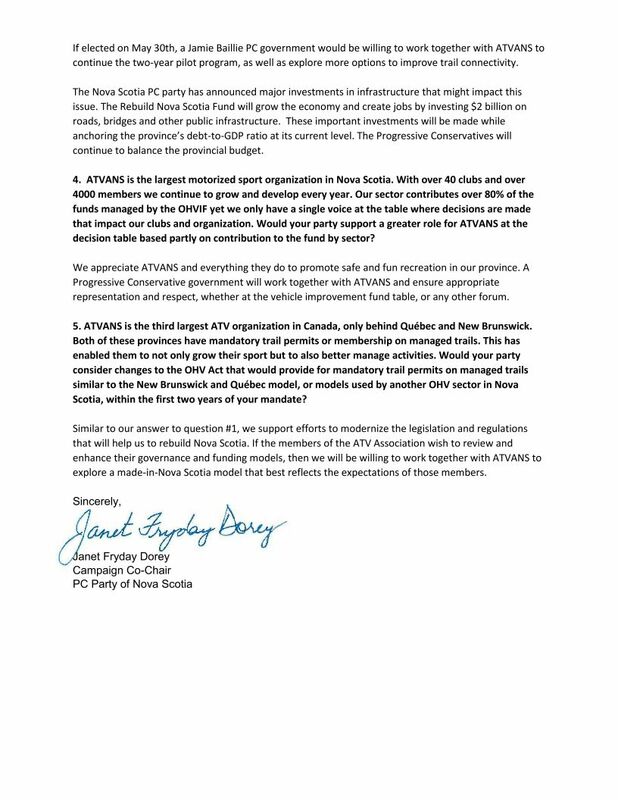 “The purpose of the study was to comprehensively determine the economic impact of not only the purchase of ATVs and ROVs but also related economic activities for Canada and each of its provinces and territories,” stated Bob Ramsay, President of the Canadian Off-Highway Vehicle Distributors Council (COHV). “The study encompassed ATV and ROV activities that included riding gear, clothing, insurance and travel related to ATV and ROV use. Together these purchases and activities constitute the direct and indirect expenditures involving ATV and ROV participation.” added Ramsay. This notice is provided by Nova Scotia Power as a safety concern for OHV users in the Wreck Cove area of Cape Breton. All members and club contacts will be sent this message directly , however, if you like, feel free to share this with others. ATVANS mission includes the following. “To promote safe, responsible organized ATV use.” Ride safe and help promote our sport and organization. Nova Scotia Power would like to inform you of new safety measures put in place at one of its hydro sites in the Cape Breton Highlands that may be of interest to your members. The utility carried out work at the Gisborne Reservoir on the Wreck Cove Hydro System this past summer to address requirements of the Canadian Dam Safety Guidelines. That work included widening the emergency spillway at the reservoir to enhance its ability to handle large amounts of water in an emergency and reinforcing the dam with rock blasted from the spillway. Because of that work a stand of trees along a drop-off that may have been familiar to recreational users of the area is no longer in place. Nova Scotia Power has installed a seven foot high stainless steel fence along that site as well as 12 large bright orange warning signs. Please exercise caution if you are snowmobiling or driving any type of motorized vehicle in this area and alert your friends to these measures. A day filled with interesting presentations and topics of interest to all Off Highway Vehicle Riders! The Symposium is offered at no cost to attendees and includes all breaks and lunch. You must be registered to attend so we can plan for meals and breaks. Snowmobilers Call 425-5454, Extension 324 (Martha) or email at info@snowmobilersns.com or call/text Mike at 902-478-7651.